Dan Gutman, Ted & Me (Baseball Card Adventures), HarperCollins, 2012, 208 pp. My son just celebrated his seventh birthday. He is an avid reader (and consequently an advanced one). He loves history, but he is obsessed with sports. For sports, he has devoured whatever he can find by Matt Christopher, Ronde & Tiki Barber, Jake Maddox–along with countless non-fiction accounts of Superbowls, team propaganda and history. For history, he read all the Magic Tree House volumes last year, and regularly checks out biographies and fact books about presidents. Enter Dan Gutman’s Baseball Card Adventures series. It’s like he wrote it just for my son. These books are about Joe Stoshack, a boy who can travel through time. When he touches a baseball card, he is transported back to that player’s era, and returns home via an unopened pack of new cards. Joe is even from Louisville, where we live. The series includes encounters with Honus Wagner, Jackie Robinson, Roberto Clemente, Babe Ruth, Shoeless Joe Jackson, Ray Chapman, Abner Doubleday, Satchel Page, and more. My son couldn’t stop talking about the stories. As he described the way that they didn’t just talk about famous events in baseball history, but in American history, I grew more and more curious. When he brought home Ted & Me, this Red Sox fan couldn’t resist. Let me tell you, this was a great book for kids, and an enjoyable read for adults too. Joe is asked by the FBI to go back to meet Ted Williams, and to get him to warn the president about Pearl Harbor. The first time around, they give him the wrong card and he ends up with Ted in Korea, as his plane is going down. When he gets back to 1941, Joe finds Ted at the end of the season, debating whether to play out the last few games and risk losing his .400 batting average. When the season is over and Ted’s legacy is made, they go together to Washington, DC, where they stumble into an isolationist anti-war protest led by Charles Lindbergh. I was surprised and impressed by the rich complexity Gutman offered in the telling of history. Like a true historian, Gutman presented 1941 as a year full of conflict and uncertainty–rather than a time when war (and victory in war) seem inevitable. 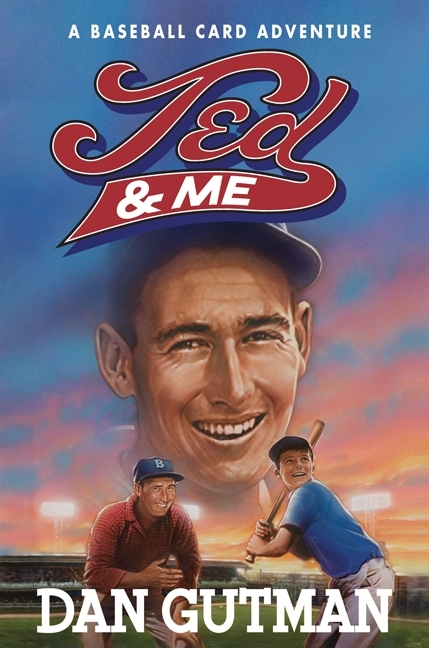 In the same way, Gutman’s portrayal of Ted Williams also moves beyond caricature. Gutman’s Williams uses plenty of salty language (how could any reasonable portrayal not? ), but replaced everywhere with the “#$%&!” trope to keep it G-rated. Williams is tough and gruff, but engages in private kindnesses. He is brave and dedicated to the craft of hitting in every way. I can’t say enough good things about this whole series. While this the only one I’ve read all the way through, I’ve skimmed the others and might read them if they weren’t always in use by my son. The books are aimed at baseball fans ages 9-12, so my son probably missed some of the subtlety. Although it was a stretch for his reading level, he was eager to push through because he loved the stories so much. These are books he will likely read again in a few years and reach a new and deeper understanding. If there is a young baseball fan in your life, Dan Gutman’s books will make them fall in love with reading.